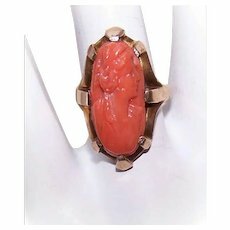 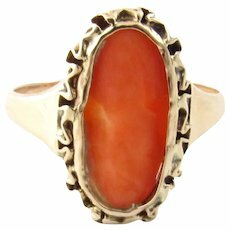 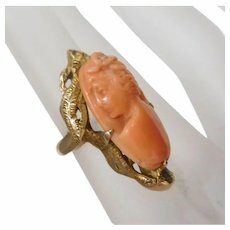 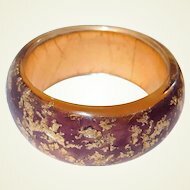 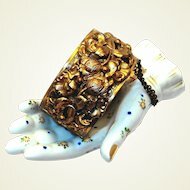 Tiger Coral Bangle Bracelet Rare Find! 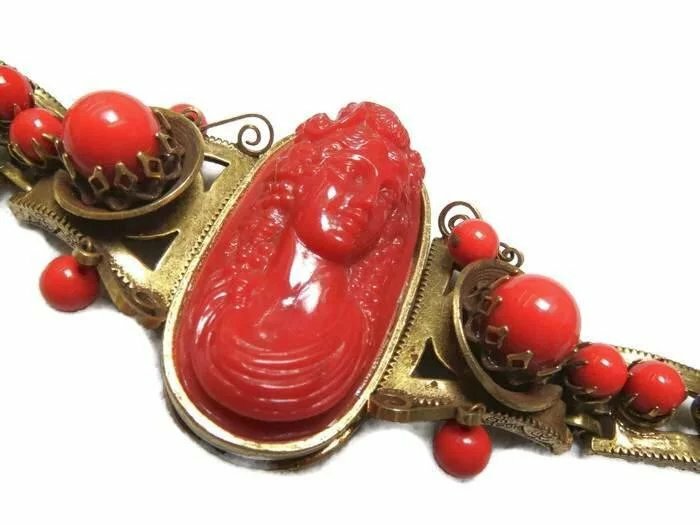 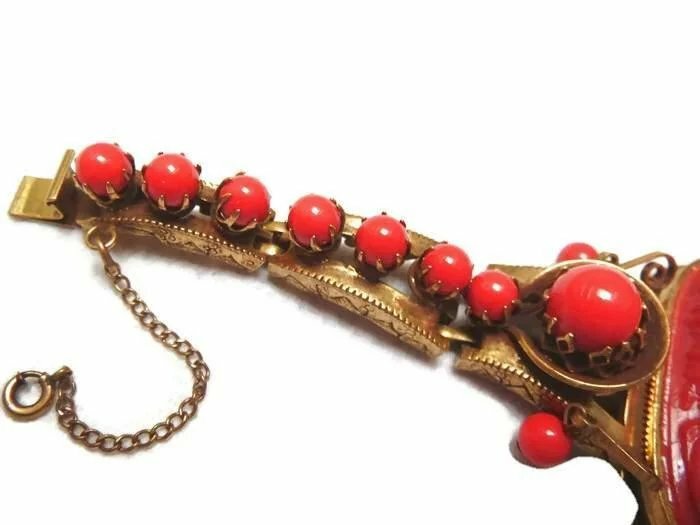 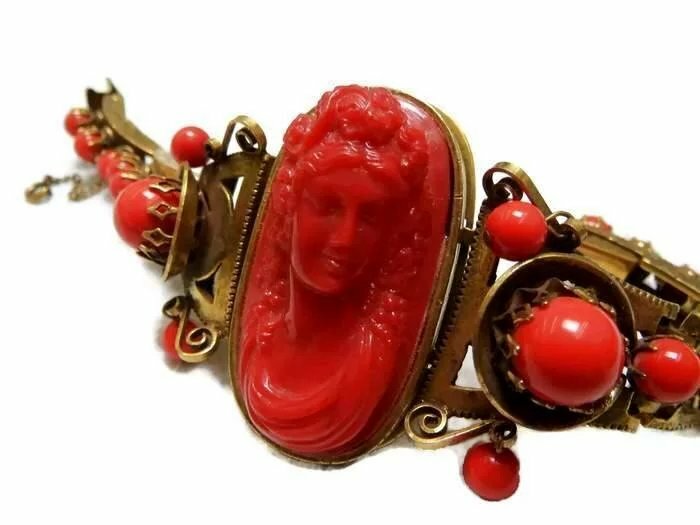 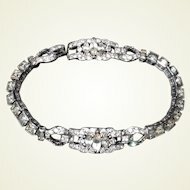 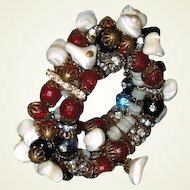 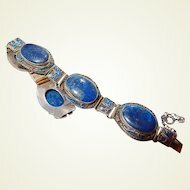 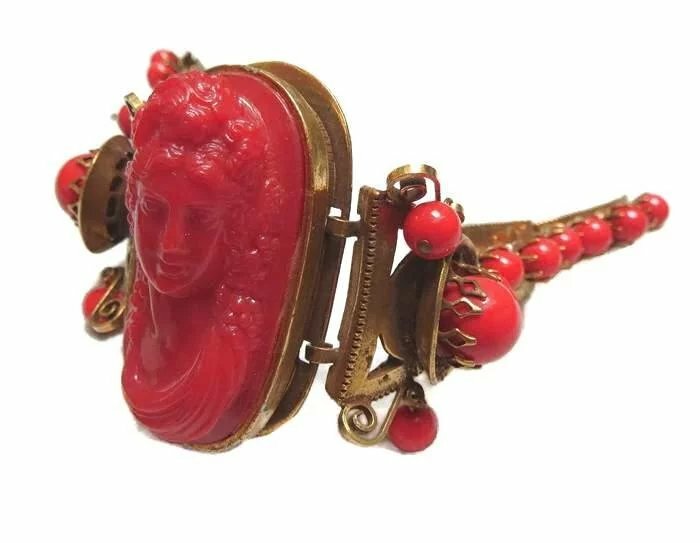 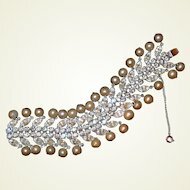 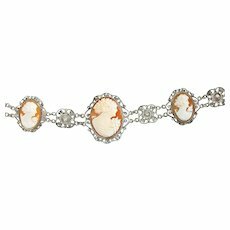 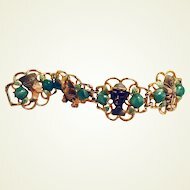 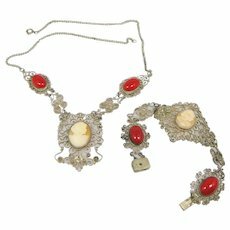 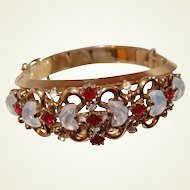 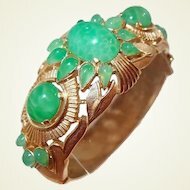 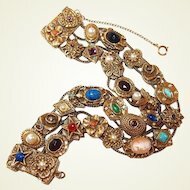 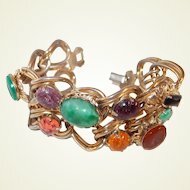 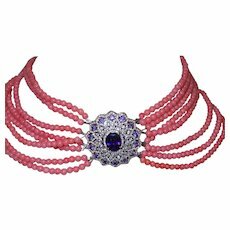 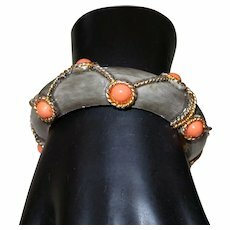 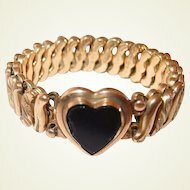 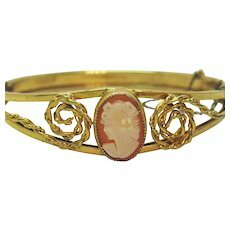 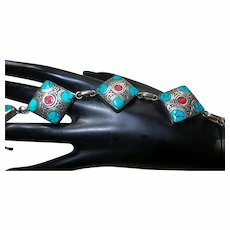 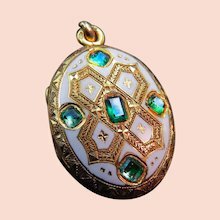 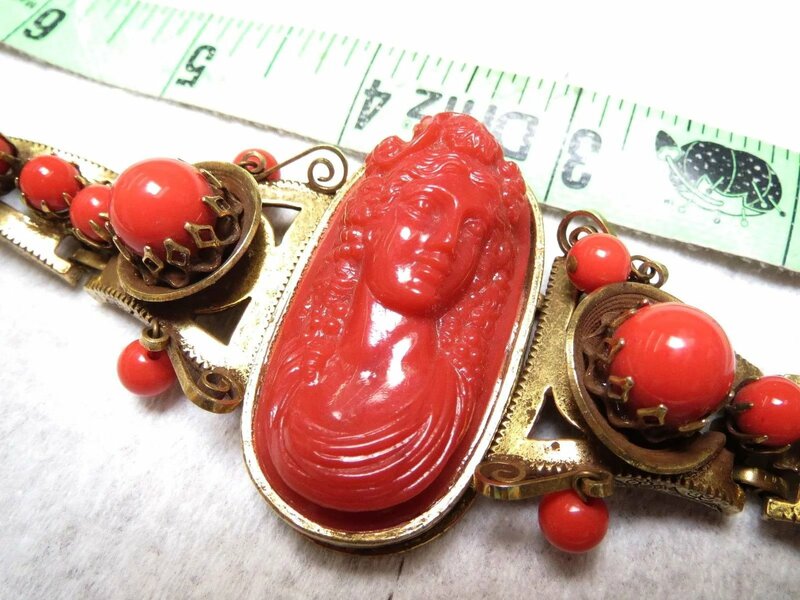 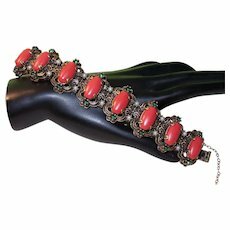 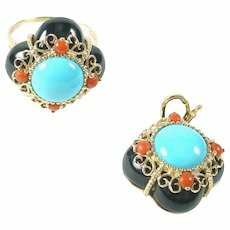 Turn of the century fabulous bracelet even has wiggly drop beads around the center cameo. 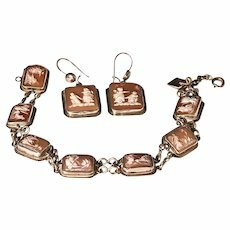 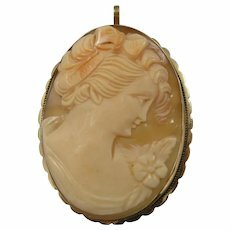 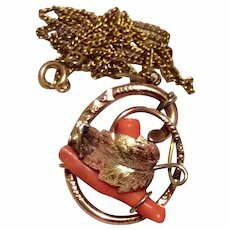 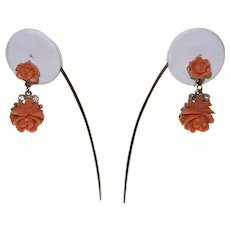 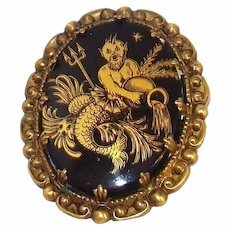 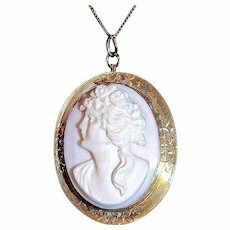 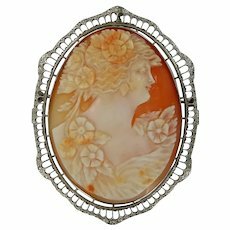 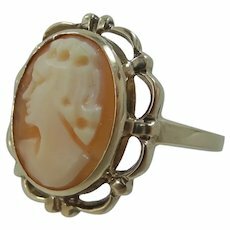 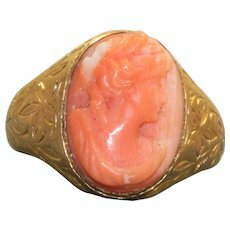 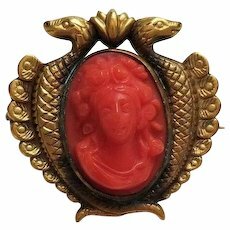 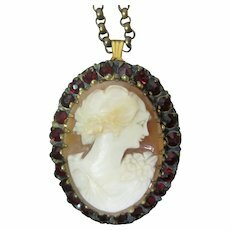 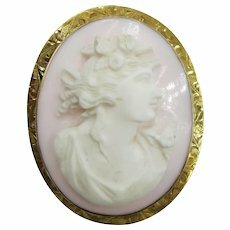 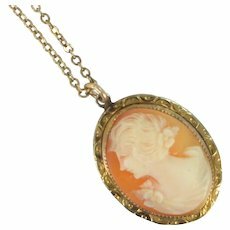 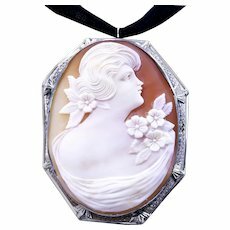 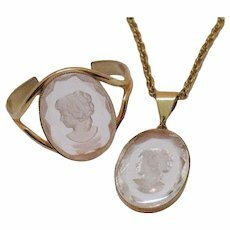 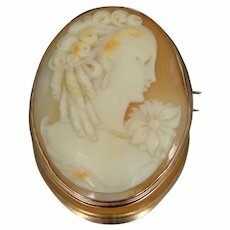 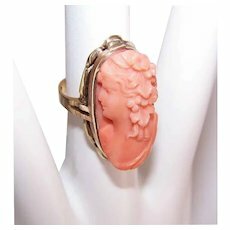 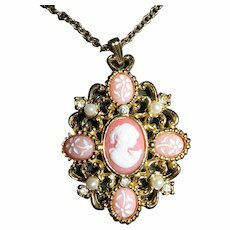 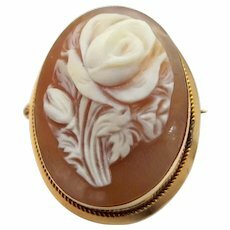 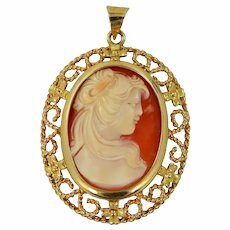 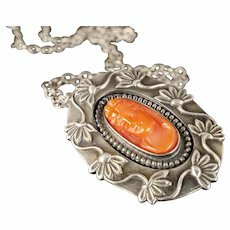 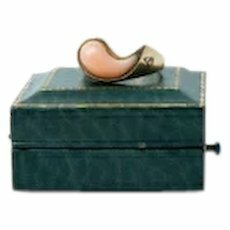 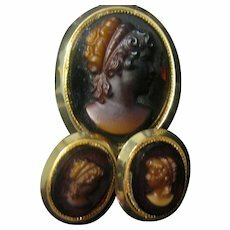 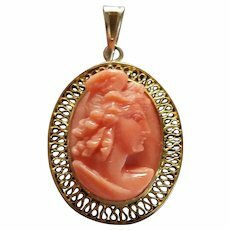 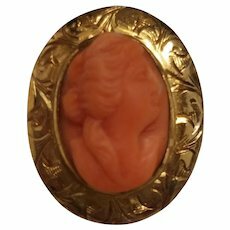 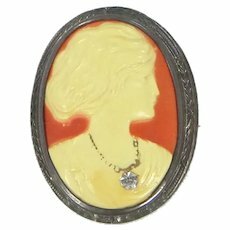 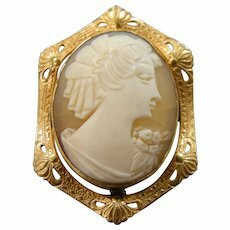 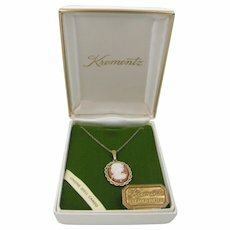 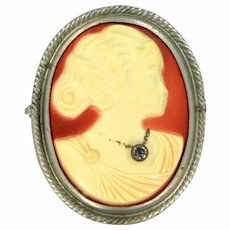 The cameo, made of coral celluloid, is set into a 1.75 inch frame. 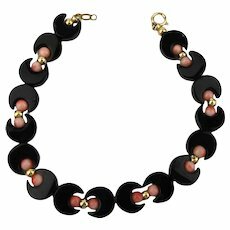 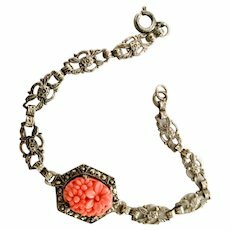 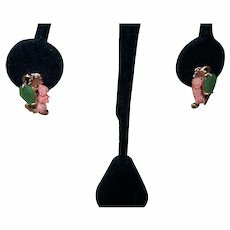 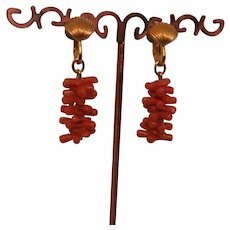 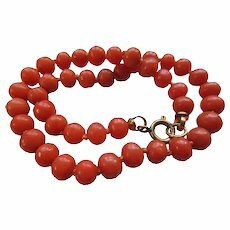 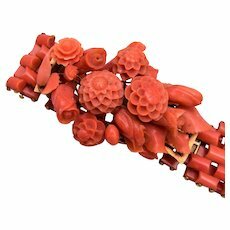 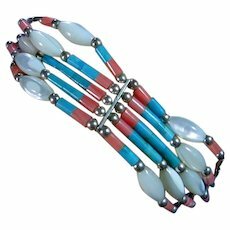 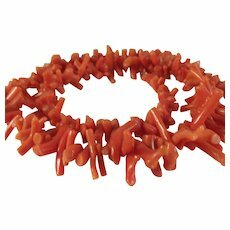 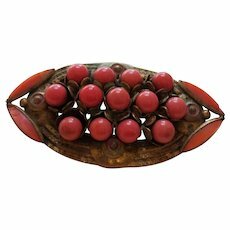 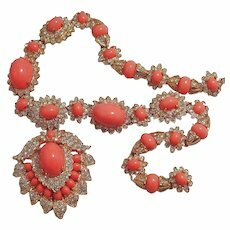 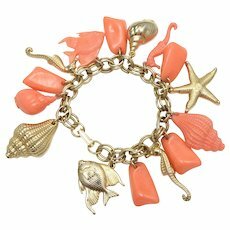 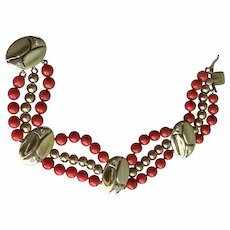 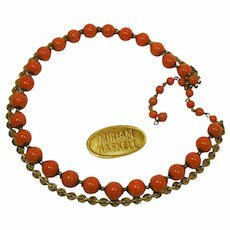 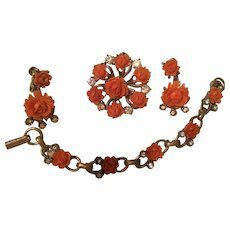 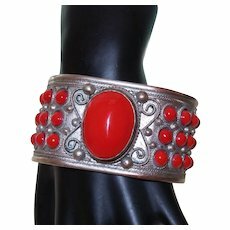 The links that form the bracelet have prong set coral glass beads for a height of 3/8 of an inch. 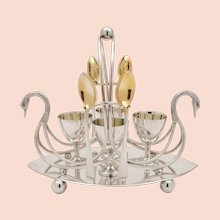 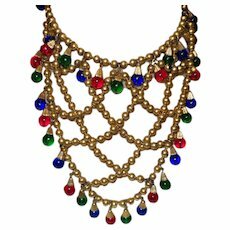 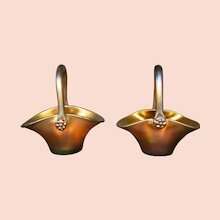 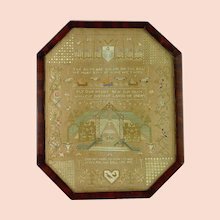 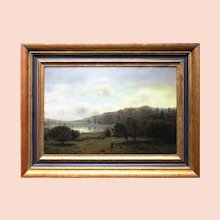 The metal is thickly overlaid in gold and shows off etched work on the sides that give an appearance of hills and trees, or to me look like pyramids. 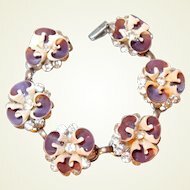 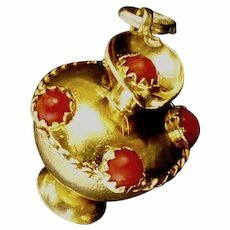 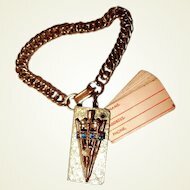 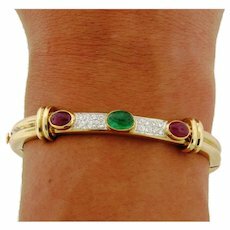 The bracelet has a tongue and grove closure with a safety chain. 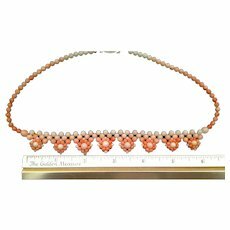 It measures only 7 inches flat, but as you can see from the photos, it is not flat. 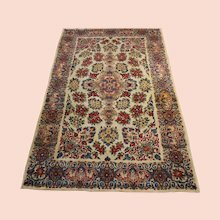 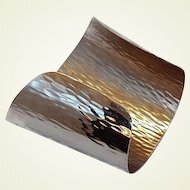 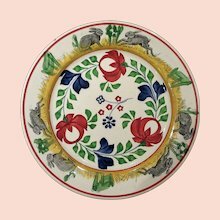 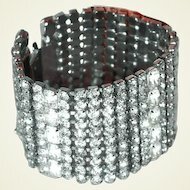 Each section is curved and gives more length. 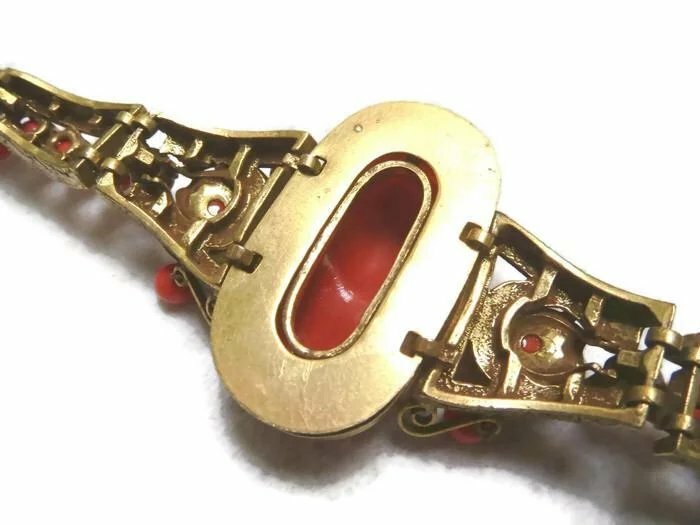 I have a 7 inch wrist, and this hangs on me. 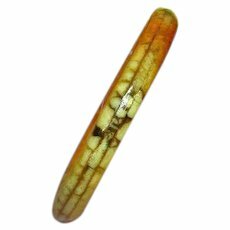 I would estimate at least another quarter inch in the length. 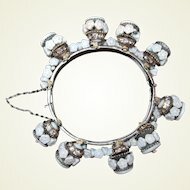 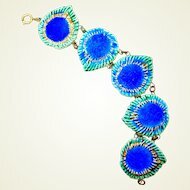 This is not your every day bracelet, and it will not disappoint.